Feedrinse is a basic RSS feed filter that can be used to filter one or multiple feeds so that only selected articles will be included in the mashup. This could remind a few users of Yahoo Pipes. The service provided by Feedrinse is however basic in comparison to that of Yahoo Pipes. 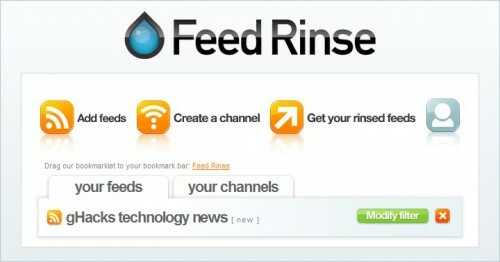 A user of Feedrinse may add up to 500 feeds to the service and group those feeds in different channels. He can do so by adding them manually in a web form or importing a opml file that contains a list of feeds. The filters can then be configured for feeds individually or for every channel. The filter options can be used to allow or disallow feed items that do or do not contain specified posts, titles, bodies, tags or authors with a certain string. It could for instance be set to only include feed items that have been written by a specific author or that have been tagged with a certain keyword. A new RSS feed link will be created that contains only those items that have passed the filter. Users who need more options to filter and customize feeds should take a look at Yahoo Pipes instead.